These days I'm a competant hacker and carefully under-hack items so that I can adjust them to the right length or visual effect. But that was NOT the case when I was a teen. I was an over zealous hacker, and a little too scissor-happy. My Mum bought me a fab bathing costume at age 15 (hello 1985), but I didn't think the legs were sufficiently high-cut after perusing the latest fashions in a magazine. So off I hacked the leg openings - disaster - and had to wear my mistake with a sarong. I was also into tops with low backs as a teen, so I cut the back scoop of some of my tees to showcase my back. Well. Those projects went south because the scoops were bigger than my back and the tees fell right off my body. Mum was not impressed. Always love hearing about your teen years Angie! Ha!! Those are great stories Angie. I hacked a few shorts to indecent lengths and could not stand to wear them. I have also had a few disasters simply due to impatience to hack off a tag!!! A few times with no scissors handy I tried to use my teeth and got lipstick on a brand new item. (Can you tell I'm on Team Wear?). Other times the scissors nipped delicate fabric and caused a terrible unravelling. Hee. My hacking-gone-wrong stories mostly involve me going something like, "oh I can just cut off the the straps, and the top part of this dress, and then oh wait I have to move the zipper and install some darts, and oh crap I have no idea how to fix this huge mess I've made." Then I have to run to Mommy and have her fix it. The end. Hmm -- only two I can think of. One was a nike top which had this bizarre metal tag sewn to the sleeve-- I was traveling for work and didn't have a seam ripper and needed an extra warm layer (the heat went out in the building we were working in unexpectedly). Well, I tried to remove the stitching with a knife and put a small hole in the sleeve which drove me nuts because of the placement of it. The other was a band tee-- I had ordered online and paid more than I normally would for a tee shirt and was irritated when it came in that it was obviously a cheap knock-off with a high, tight neck. Turns out that I had missed the fine print-- it was returnable, but the restocking fee and return shipping would have eaten all but about $7 of what I had spend. The quality was not the best, so I thought I would try a tutorial for modifying t-shirts off the internet. Epic fail! The result was not flattering at all and despite great care, a little uneven. It went into the rag bag. I have successfully made men's pants into shorts before, so I'm not just inept. Suz, I hear you on team wear. Impatient to wear a new St John (outlet) long jacket earlier this year, I cut off the cheap looking hooks and eyes down the front. I ended up snipping the knit fabric, leaving 8 little holes down the front. So it still had to do time at the tailor being fixed. I have also made countless holes cutting out scratchy neck labels. Why is the label the best sewn piece on an item, yet the buttons fall off after one wear? Lol @ LisaP -- about hacking Barbie doll hair -- I think it's something we all do at some point! My daughter succumbed to the irresistible urge when she was about nine. I let her do five or six, then stopped her, in case any other little girls wanted to come over and play with Barbies that actually still had some hair. I only ever had one Barbie myself (I didn't care for dolls as a child), the "Pretty in Pink" model, and when I was twelve I turned her into "Pretty in Punk". I chopped off her hair to create a pixie 'do with long gravity-defying 1980s bangs, painted black lipstick and eyeliner on, made her face goth white, and turned all her clothes black using a fat sharpie pen. Her long elegant tube skirt became a raw-edged mini, and I painted her legs black to look like stockings. I even jammed a "cigarette" (made from a tiny piece of toothpick) into that little hole in her hand where the diamond ring is supposed to go. I gave the dog more than one inept haircut in her lifetime. By the time our kids came along, I'd had a lot of practice, so their haircuts weren't too bad. One time I messed up my daughter's bangs, but she was only two and it grew back quickly. Other than that, I'm not particularly scissor happy. I get nervous cutting things that don't grow back! (This might be because I can't sew). I cut off a pair of jeans into shorts once every few years, but I'm super careful and start out by making them way longer than I think, and then trying them on and readjusting. I've cut the neck holes out of some old tee shirts too, to make them more feminine. I'm also a label hacker and have had many holes and unravelings. My 2 & 1/2 DD comes running to me in a tizzy if she finds a label on any of her clothes or even stuffed animals. So I've passed on the craziness. Oh, the label thing! I have put more holes in clothes by trying to cut out the labels than I care to think about. AviaMariah, I'm reminded of this video, which about made me die laughing, it's so true to life. Sorry I have to run off, but thanks for the laughs, ladies. Lisa, I hereby crown you Queen Hack. HAH. Suz, the lipstick story is fab. I think I was in high school or junior high. Decided I wanted sort denim shorts. I cut through the crotch. Nano-mini anyone? When I first read this I Was thinking computer hacker and couldn't imagine you as a black hat. 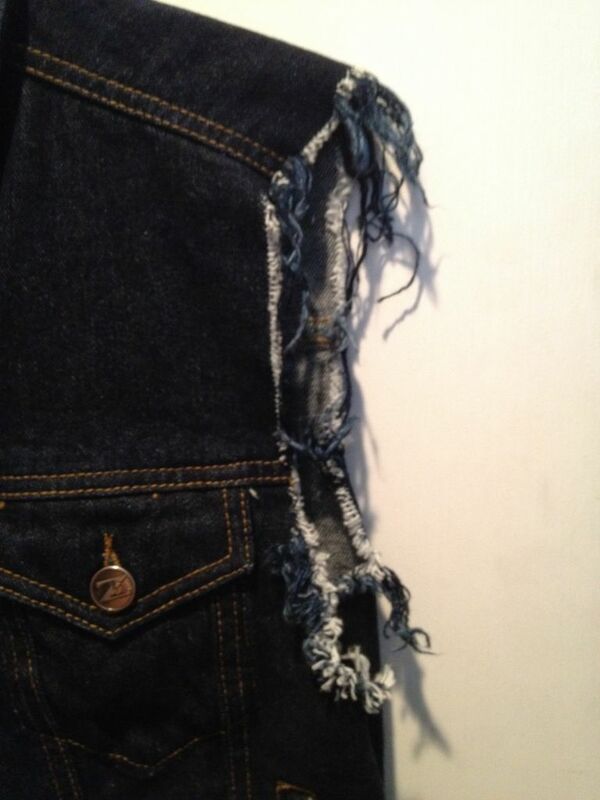 - DIY distressing and patching. It gave me new appreciation for the crafts people who make really artistic distressing (such as found on my old True Religion boyfriend jeans, now passed on, but much loved). - Turning a vintage 40s long gown into an 80s style Christian Lacroix pouf dress (!). I did it by hand and I think the seams were all very uneven. In college in the 1980's I tried to turn a T-shirt into a trendy crop top . . . but overestimated how much to hack off the T-shirt. Most of my oopses are related to cutting the tag out of sweaters. I usually try to do it in a hurry because the thing has been bugging me all morning. 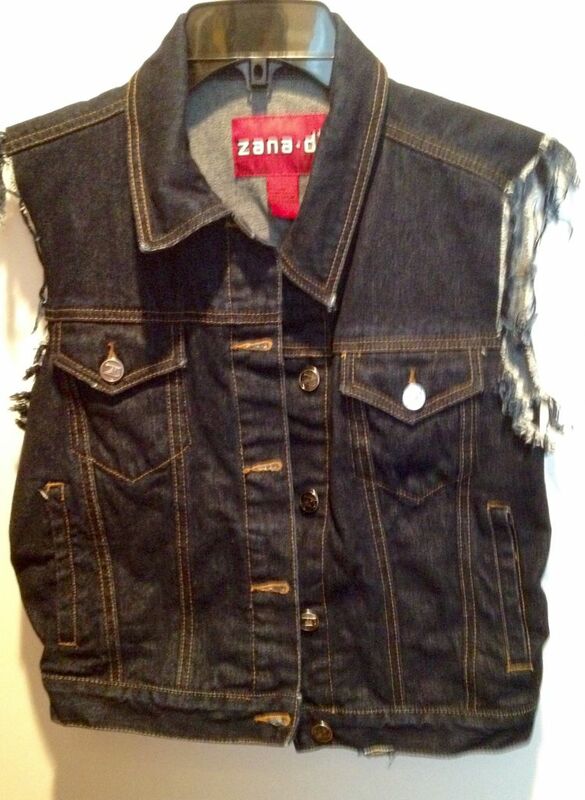 Joy, you may be able to fix your denim vest hack by trimming off the unwanted extra "fringe", and using a sewing glue product called "fray check" on the remaining raw edges to stop any further unravelling. I was just going to suggest Fray Check for Joy as well. Good stuff! Jeweled and Marilyn, thank you for the Fray Check idea. I will probably need a ginormous size. I was toying with the idea ofjoiningthefall fringe trend, maybe even fringing the cut off sleeves and sewing it on the back, but DH would not want to be seen with me. How about hacking my own hair? Frontal part too (age 4). Ended up with a very 80's mullet, except this was in the early 70's. Clothes wise, my worse mistake was hacking a pair of bootcut regular length jeans into ankle pants for a petite. Very bad idea. The part at the ankle was too wide and it did really look like someone had chopped off part of my lower legs! A shame too, because they were a nice pair of Levis. I can't recall any sartorial hacking failures at the moment, Angie. But LOL reading about yours during your teenage years! How about cutting off the same leg twice when trying to shorten a pair of pants? Your stories are hysterical and I'm glad you had a sarong to throw over the hacked bathing suit, which wasn't what you initially intended for your fashion debut. Similar to Suz, I detest scratchy labels and have wanted to quickly remove such nuisances immediately and I've created a few air vents in the process. Not pretty! I recall cutting off my denim "cut-offs" so short that I then had to add some fun hippie patches on the sides, because they were slit too short. There was also a short-sleeved tee that I thought would look better as a tough sleeveless shirt. Alas, my image and the end product didn't match up. I think my hacking days are over and I'll respect the designers' choices.